For the sewing/needlecraft enthusiast, I have designed a beautiful vintage style needle book with gorgeous handprinted soft victorian pink butterflies and soft pink/brown distressing. It's topped with a stunning wooden floral button. This looks like it's been handed down through the generations and I love that! With polka dot cotton braid on the spine - topped with a gorgeous crystal tag made by hand, and the body of the book made of natural cotton fabric. This book has four pages of pink felt to hold an abundance of needles! 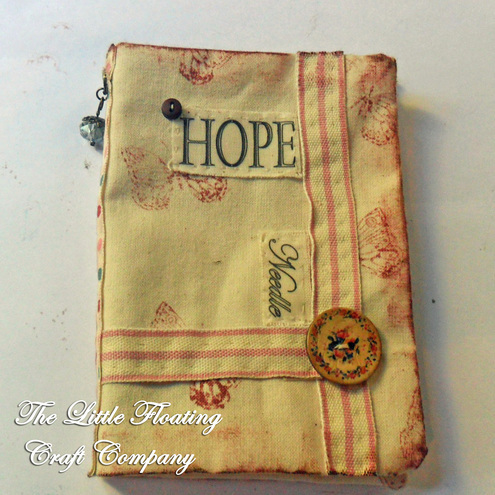 Come and visit us at www.facebook.com/littlefloatingcraftco for more pictures and updates on work in progress, as well as designs not listed on Folksy!